Meateater Man is strong and healthy. His strength comes from the meat in his diet because protein builds good muscles. A traditional Inuit diet consists mostly of meat and animal fats. With this diet, Inuit live long healthy lives. Crunchy Carrot reminds us that to crunch is best and that snacking on crunchy things like carrots, celery, broccoli, cauliflower, peppers, pears, apples and berries is fun and healthy. King Caribou teaches that protein is what builds muscle and helps us grow. Protein also makes our blood strong and helps us fight sickness. Without protein your body cannot work as well. Stretchy Cheese is a flexible friend who teaches us how milk, yoghurt and cheese give you strong teeth and bones. Water Woman is clear and fresh, fast and always flowing! What a beautiful super hero! She encourages us to drink water to help our body be like hers. The storybooks are an educational and fun resource for early childhood educators, teachers and parents. Limited access to healthy foods and the high cost of food in northern and remote communities contribute to food insecurity in Inuit families. 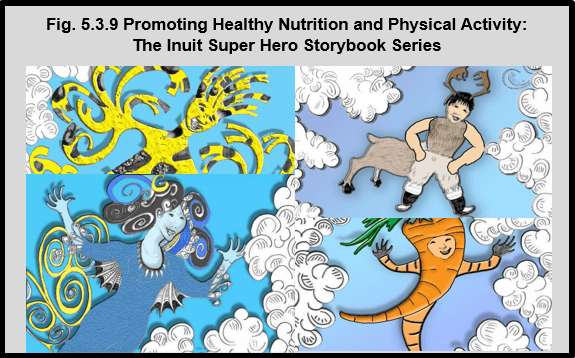 As a way to help promote healthy food choices, traditional/country foods and physical activity, the Arviat Wellness Centre, Nunavut Arctic College, Canadian Institute of Child Health (CICH) and numerous Inuit partners have partnered to create a series of fun storybooks for young children. All six story books can be downloaded now by clicking on the titles below. In addition to the Inuit Super Hero Storybooks a song contest took place where Arviat community members wrote a recorded songs. Listen below to some of the fun songs that were developed to help reinforce healthy food/drink choices and physical activity.